NANOG is scarce in early-stage cancer but abounds in Stage III liver cancer. It promotes the cancer's spread by rewiring metabolism in the mitochondria — a cell's energy factory. 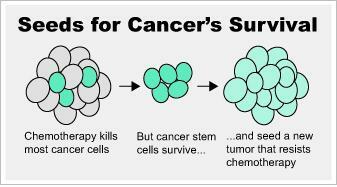 "We identified the Achilles heel in cancer therapy," Machida said. "There are bad seeds in cancer. Even though we treat patients with chemotherapy, those bad seeds survive and force relapse. That's why we would like to target the bad seeds in cancer to eradicate recurrence problems and metastasis, which is when the cancer spreads to other parts of the body." The study will be published in the Jan. 12, 2016 issue of the journal Cell Metabolism. Liver cancer is on the rise. An estimated 24,550 people died of the disease this year, according to the National Cancer Institute. Only 17.2 percent of people diagnosed with liver cancer survive for five years or more. "Mitochondria-metabolism targeted therapy in cancer is being increasingly recognized as a promising area for future development of new, personalized treatment strategies," said Punj, associate professor of medicine at Keck Medicine of USC. "If you reduce the cellular response to mitochondrial oxidative phosphorylation-fatty acid oxidation molecules, NANOG will not be able to promote cancer progression. This will enable researchers to develop novel therapeutic strategies for that cancer." NANOG controls the expression of genes that form 'mitochondrial metabolic pathways' — energy sources — for stem cells that turn into tumors. It reprograms cells: Instead of using glucose as gasoline, they are ordered to use fatty acid. "If we shut down this alternative pathway, the liver cancer will become sensitized to chemotherapy again," Machida said. "In the future, we might be able to give liver cancer patients a shot that will infuse NANOG-targeted therapy into the blood stream. Wherever blood circulates, we will be able to deliver new instructions to the bad seeds of cancer."